Last week I purchased two historical Beccles postcards. Both were in relation to the late Canon Rowsell. My first thought was, "Great, I can write a blog post about him". When the postcards arrived in the post on Thursday I thought how timely it was as I could use the images as part of a special Easter blog post. Imagine my surprise when I discovered that Canon Rowsell's first sermon at St Michael's Church, Beccles was on an Easter Sunday! John Rowsell was born in Kennington, county Surrey on 4 January 1853, the second known son of Nicholas Henry Rowsell (solicitor) and Mary Ann, nee Bishop. John was baptised one week later at St Mark's Church in Kennington. The Rowsell family resided in Foxley Road, North Brixton up until 1860 when Nicholas Henry Rowsell died, aged just 33. His solicitor's firm was situated at the Verulam Buildings of Gray's Inn Road, in London. 1895-1910. Married, July 2, 1879, Alice Lucy, youngest dau. of the Rev. Richard Wilson Greaves, deceased, formerly R. of Tooting. Died June 7, 1910. The 1881 census returns show John Rowsell with his wife and their daughter Alice Myra residing in Beverley, county Yorkshire. John's occupation reads thus: "MA Camb. Perpetual Curate in Beverley Minster". The Rowsell family moved to Beccles the following year, in 1882. The Beccles Paper of 14 February 1882 states: "NEW RECTOR: Rev. John Rowsell, minister of St John, Beverley, Yorkshire accepted after resignation of Rev. F.F. Tracy." On 28 March 1882 the Beccles Paper reported that Rev. John Rowsell had preached his farewell service in Beverley Minster, where for three years he had been Perpetual Curate. On Sunday 9 April 1882, Rev. John Rowsell preached for the first time at St Michael's, Beccles and was warmly recieved. So much so that newspapers and documents of the day consistently reported Rowsell to be "a kindly and sympathetic clergy-man of liberal views." 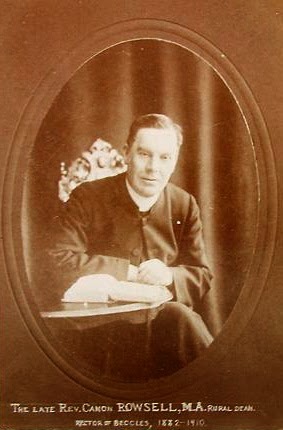 In 1887, Rowsell was appointed Surrogate of Norwich Diocese. The 1891 & 1901 census returns show the Rowsell family residing in Ballygate, Beccles. As he was the Rector of Beccles, Rowsell and his family would have been living in The Old Rectory (now a Grade II listed property). In February 1895, John Rowsell was appointed as Honorary Canon in Norwich Cathedral. 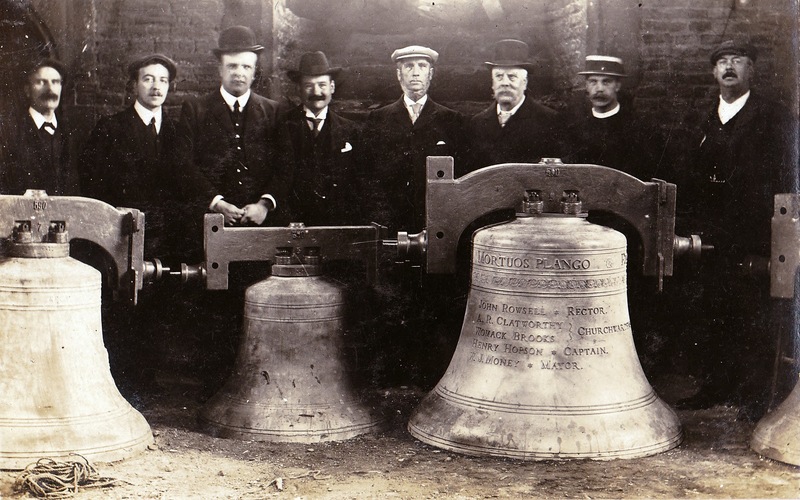 John Rowsell and his family were all productive members of the Beccles community, participating in many societies such as the Temperance Society of Beccles and were staunch advocates for good education for all children. In 1899, four of Canon Rowsell's children took part in a Juvenile Fancy Dress Ball. One of these children in particular, Monica Rowsell, went on to taking part in Church fundraising concerts where newspaper reports claimed she sang "in a pleasing and most splendid manner." 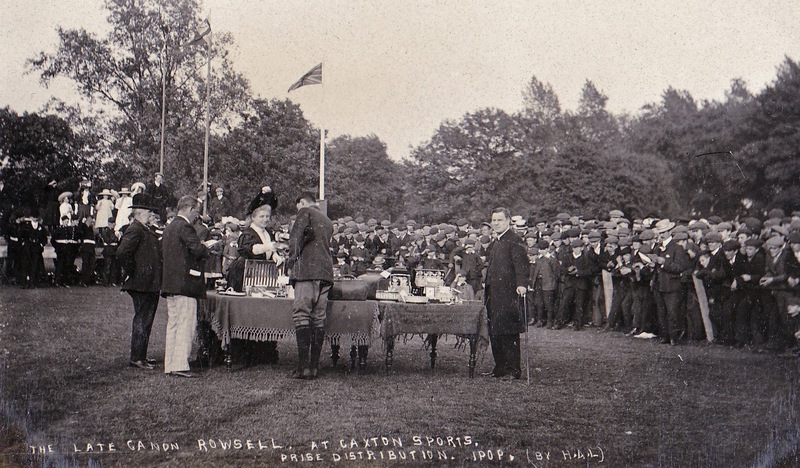 Before Canon John Rowsell died on 7 June 1910 (King Edward VII had died just one month previous), he had presided over many meetings for the community at large including the Public Library, Agricultural and Horticultural Societies, Church of England Society as well as presenting prizes at Caxton Annual Sports, Regattas, and Schools. The East Suffolk Gazette of 14 June 1910 reported that Rowsell: "Introduced parish magazines, also kneelers; Organ renovated & decorated, erection of brass tablets encouraged. Reredos [altar-piece] 1884; East Window, Memorial to Queen Victoria's Jubilee 1887 (£500 public subscription); Trained surpliced Choir." He was indeed a very altruistic and industrious man, who was no doubt sorely missed by the people of Beccles when he passed away, aged 57.
which had been re-tuned and re-cast. in July 1909, presentations seen above. In July 1911, after a committee meeting earlier in the year in which it was agreed that a three-light window on the south-side of the church should be filled with a stained glass design in his memory, a Memorial Window dedicated to Canon John Rowsell was erected in St Michael's Church. very interesting. I am researching the Rowsells of South London for my own blog and will do a post on this fellow.